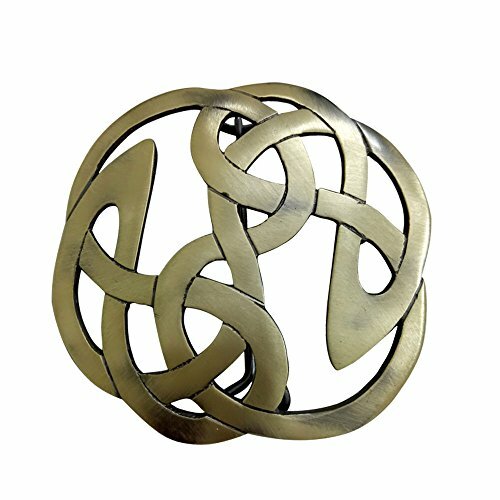 Kilt Fly Plaid Brooch Celtic Knot Design with High Quality Brass Antique Finish.Secures with Pin and hook.Brooch size approximately 3.5" This Stunning Antique Finish Plaid Brooch Made Of Brass. It Features a Beautiful Design in Its Center.. This Brooch Would make the Perfect Finish to any Fly Plaid, Kilt Outfit or even Shawl. It comes beautiful gift pack Premium Quality Brooch. Money Back Guarantee. If you have any questions about this product by AAR, contact us by completing and submitting the form below. If you are looking for a specif part number, please include it with your message.